Explorations of Persian culture and politics. Heavy governmental security on the streets of Tehran preventing Green Movement marchers from reaching Azadi Square, February 11th 2010 (22 Bahman). As the Iranian authorities continue to brag about the success of the February 11 rallies, the Iranian Cyber Army has renewed its attacks on Persian websites that are now distributing real news and images from the event. News coming out of Iran, slowly but surely, reveals the highly orchestrated nature of the rally, the heavy transportation of the people from the provinces. More importantly, the news coming out of Iran explains why the Iranian official media did not go live with their reporting and the pictures they showed later where closed angle and from limited locations. * Friends leaving Tehran for the U.S. early in the morning of Monday, February 8, described the condition of the city as a full blown martial law. Streets were barricaded with armored cars, and passing cars were inspected to ensure the streets remain empty of Green Citizens for the Feb. 11 rally. * These and many other facts were not accessible to foreign reporters who arrived a the right time and traveled along selected routs. Reporting on events which the Iranian government wants to present in a certain light is, therefore, a highly risky and complicated matter which poses ethical and political questions. I have a recent piece discussing this particular issue in the online magazine Counterpunch. In it, I quote from a moving letter by Iranian journalists in exile speaking about their jailed counterparts in Iran: http://www.counterpunch.org/keshavarz02112010.html . And, to see many more videos of the buses, click here: http://www.rahesabz.info/story/10205/ . * While the carefully imported supporters recieved cake and fruit juice, the following treatment was reserved for the opposition: http://www.facebook.com/mousavi#!/video/video.php?v=107608539255933&ref=mf . * Down with the dictator: http://www.facebook.com/mousavi#!/video/video.php?v=107603179256469&ref=mf . * And Iranian.com, another site which keeps posting Feb.11 protest videos as they come in: http://www.iranian.com/main/2010/feb/protests-22-bahman . * Young and energetic Iranian Americans are becoming more and more involved in producing intelligent and informed discussion on the internet regarding the country of their cultural heritage. I have news of one such site for you: http://www.iranunfiltered.com/ . Do visit the site. And as you enjoy the new headlines, news and analysis remember the web master is from St. Louis. Have fun! * I send all our best wishes to my anonymous e-mailer who has been providing wonderful personal insight …and whose brother has been shot in protests. Fortunately he is alive and recovering. We will refrain from contact for a while. * Music from the province of Gilan in Northern Iran is particularly lively and cheerful. Men and women working in rice and tea fields sing these songs. Here is a short clip with a Gilaki song and lots of beautiful images from Gilan. Enjoy! http://www.kalam.tv/fa/video/13876/index.html . Have a great week, and pass on https://windowsoniran.wordpress.com/ to friends. 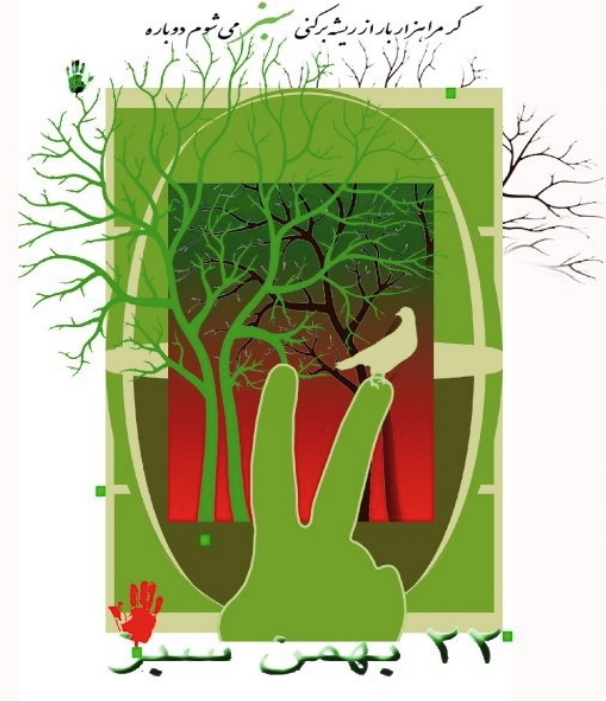 One of the MANY posters calling for peaceful "Green" protests on Feb. 11th in Tehran and other major Iranian cities. Please see the posters throughout this post as well as the link at the end of this post for many more. Greetings from Washington University in St. Louis…after a long delay. As those of you in academia know well, spring semesters are notorious for being busy. To attend to my teaching and departmental duties, the windows (e-mails and the blog) had be put on the back burner for a while. I am happy to be back with a plan: to make the windows shorter so I can sustain them. While you not have had a chance to follow the details, the Green Movement has sustained itself in the face of much brutality from the government. * Last week, for the first time, in an interview with the online magazine “Kalameh-i Sabz,” Mr. Mousavi suggested that the goals of the 1979 revolution for democratization of Iran have not been achieved and therefore, the revolution is incomplete. Furthermore, he said that “Religious despotism” is the worst kind of dictatorship. A group of us have praised his courage and expressed support for his position in an open letter (available here: Open Letter In Support of the Greens), which will be publicized shortly. If you are an academic of Iranian heritage and would like to add your voice to ours please e-mail your willingness, name, and position to: drahni@optonline.net and please do so a.s.a.p. * As green Iranians prepare for a massive rally on Thursday, Feb. 11, two major religious figures, Ayatollah Mousavi Ardebili, and Hojat al-Islam Hashemi Rafsanjani warned the supreme leader, Ayatollah Ali Khamenei of the consequences of his actions. Both these political and religious authorities asked for immediate, and unconditional, release of political prisoners and suggested that Mr. Khamenei distances himself from extremists. 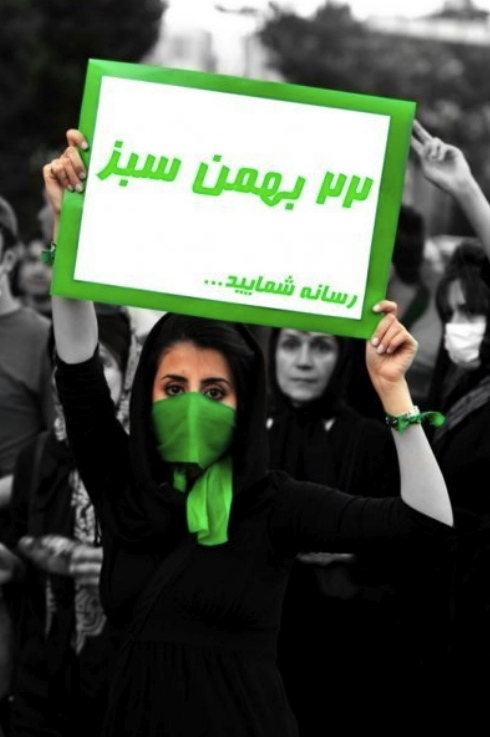 One of the MANY posters calling for peaceful "Green" protests on Feb. 11th in Tehran and other major Iranian cities. Please see the posters throughout this post as well as the link to the left for many more. * Come out in large numbers! The foreign press is present and you will be safe. * Do not wear clothes that make you conspicuous. * Instead of shouting your slogans and possibly being arrested, write them down in public places. * Don’t use any form of violence, verbal, or physical. * Take as many pictures as you can. 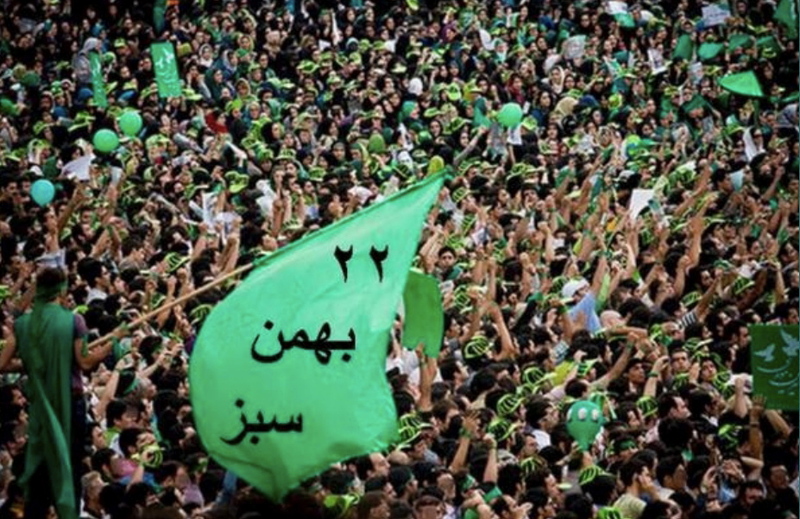 * Do not take your green signs out until you are in the Azadi Square …or close. * When Mr. Ahmadinejad begins to speak, take your green signs out, stand up and turn your backs to him. To see a nice selection of the posters, please click here February 11, 2010 Posters to see the power point slide show that I have prepared. It is not even a third of what is being distributed. I just did not want to make the file too large. 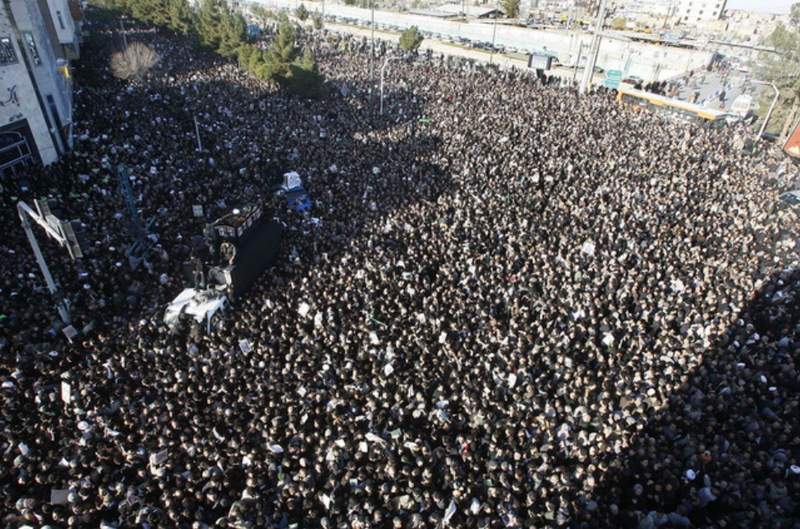 The State-run newspaper "Keyhan" estimated the crowd at Ayatollah Montazeri's funeral (above) at only 5,000!!! Today has been described as a new day in the life of the Iranian Green opposition. At the request of Mr. Mousavi and Karrubi, hundreds of thousands of people turned up to participate in the funeral of the Grand Ayatollah Hussein Ali Montazeri who passed away on Sunday. Ayatollah Montazeri parted ways with the founder of the Iranian Revolution over the issue of human rights violation in Iran (among other things). * The Iranian official news agency described the funeral attenders as approximately 5,000! It is not quite clear how they think they can maintain the appearance. However, look at the photo above this message to see a shot of the “five thousand” mourners for yourself. * Not surprisingly, Ayatollah Montazeri’s personal website seems to be down (possibly hacked). In the absence of that, I refer you to this general article: http://en.wikipedia.org/wiki/Hosein-Ali_Montazeri. Don’t forget to share “https://windowsoniran.wordpress.com/” with friends. Grand Ayatollah Montazeri, one of the spiritual leaders of the Green Movement, has passed away. Grand Ayatollah Hussein Ali Montazeri, died last night at age 87 in the city of Qom. In the past few months, he had come to be known as the spiritual father of the Green Movement in Iran. Mr. Mousavi and Karroubi have declared tomorrow, Monday, Dec. 21, a day of national mourning. Grand Ayatollah Montazeri was designated successor to Ayatollah Khomeini until their major fall out in 1988. Montazeri’s dismay was caused by many issues including the executions of the opposition leaders, the lack of openness to political parties, and the insistence on exporting the revolution. Not only did Ayatollah Montazeri loose his political position as a result of objecting to these policies, he was condemned to house arrest, severe curtailment of his personal activities, and regular abuse by the state run media. In real life, he never lost his respect among the general public or the other grand Ayatollahs. His images surfaced at almost any public protest. With the crystallization of the Green Movement after the 2009 election, Montazeri emerged as its spiritual father. He issued daring statements in condemnation of the government’s abuse of power, repression, and particularly torture and abuse in the Kahrizak prison. His death is unlikely to be good news for the current regime in Iran. It has already triggered events, even before the designated day of morning, which they are trying desperately to prevent. Below see a small sample coming out of Iran hours ago. 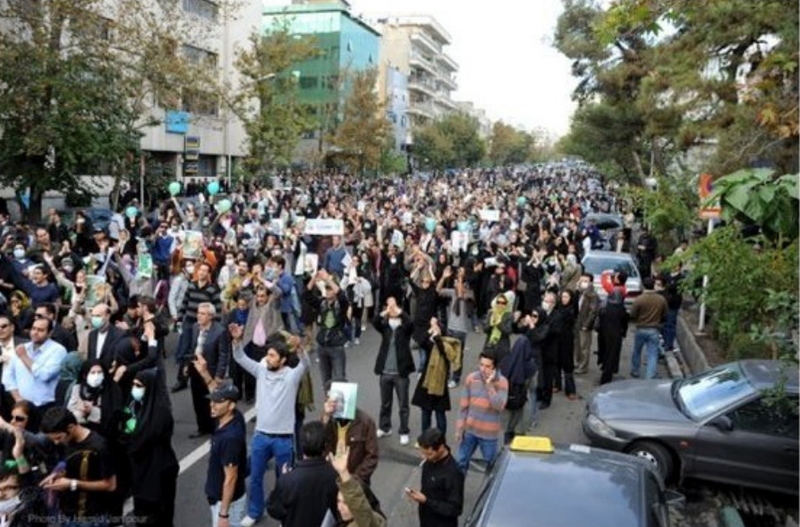 Iranian students flooded the streets and campus today, December 7th, 2009. See the videos below for live coverage. Incoming reports, limited to eyewitness accounts, and short clips taken by cell phones and posted on youtube, indicate that the protests continued in many cities in Iran, amidst arrests and attacks, into the afternoon and early evening hours. The most common slogan addressed to the members of the Revolutionary Guards militia, the Basij, was “How much money do you get to wield that baton?” This particular clip was taken from facebook and posted on the NIAC website: http://www.facebook.com/video/video.php?v=105011899516362. The Iranian government suspended the permits of the foreign press momentarily so they could not report the student protests of today. Perhaps they would have been wiser to permit proper reporting. Below there are clips of student demonstrations across Iran. Pieced together, they picture an ominous future for the regime which seems unable to overcome its state of denial of the reality. I could have added many more clips. * Some major cities in the world predicted the events of today and expressed solidarity with Iranian protesters. Let me share the video of a beautiful modern art work that the Canadians made to express their support for these protesters and the Green Movement as a whole. * Today’s demonstrations were used by government forces to make targeted attacks. Among these was an attack with pepper spray on Zahra Rahnavard, the wife of the presidential candidate Mir Hussein Mousavi. Rahnavard, whose eye sight has been effected, is in hospital. * Another victim of the police was Mohamad Ja’far Tahmasebi, the cultural coordinator of the student organization affiliated with Mr. Mousavi’s campaign. 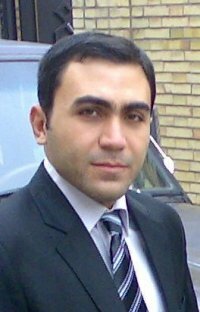 He was arrested today while protesting with fellow students in Tehran. * Before closing this special window, I am going to turn to another struggle the Iranian students have been facing in another part of the world. * Court Hearing in case of Iranian Students, 10 December 2009: Since July 2008, the Dutch Government has banned Iranian citizens, as well as Dutch citizens of Iranian descent, from parts of certain university graduate programs. In addition, five locations have been designated as forbidden for the latter group. This measure is presumably meant to avoid the ‘proliferation of sensitive information. Iranian students have been objecting to this ban arguing that securing any information can be perfectly achieved without such a discriminatory measure. * The Campaign of Iranian Students has taken legal actions against the Dutch government, and the case will soon appear before the court. Although the initial assessments are promising, the students have asked for public support, especially in the form of their presence during the court hearing. The court hearing is scheduled on Thursday, the 10th of December at 10:30 am at the Palace of Justice in The Hague. Please remember to share the website https://windowsoniran.wordpress.com/ with friends. 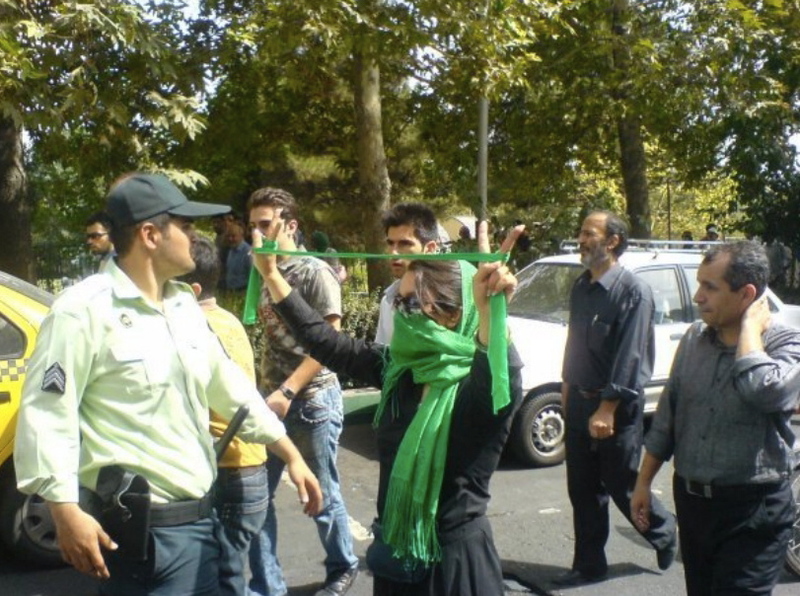 A photo of one of the courageous Iranian women defying the government's orders and proudly demonstrating in favor of the Green Movement during the November 4th, 2009 "Quds Day" protests. I hope you are well. I have not sent you a window in a long time. This is not because in Iran the opposition has stopped its efforts or some of the issues have been resolved. As you see from this window, neither of these is the case. The delay is merely the result of my business with teaching and departmental duties. So, without further ado, let me open window 98. 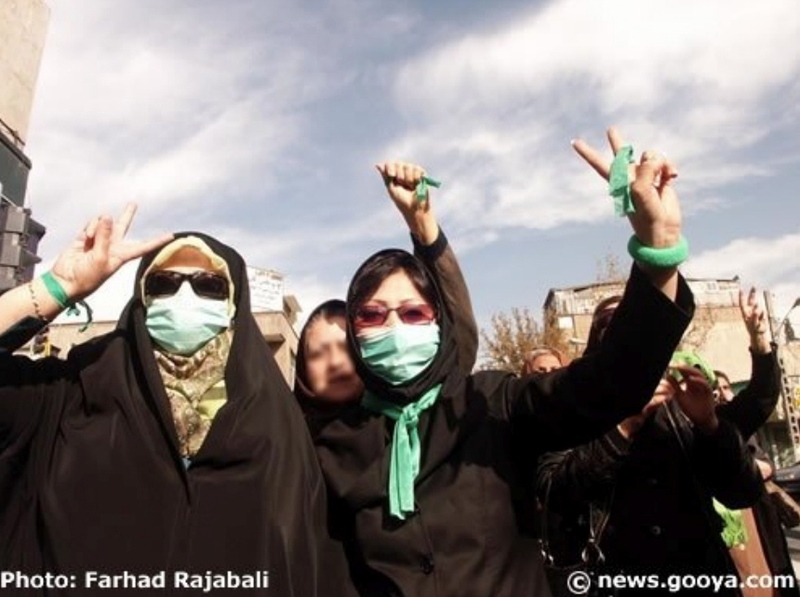 * Images from Iranian Greens have now become part of the world visual repertoire. To the right, is another incredible image of courage during the Nov. 4th protests. The image was circulated worldwide. * Since the controversial re-election of Mahmoud Ahmadinejad in June, determining the degree of his support among the population in rural and small urban areas has been at the center of debates over the issue of electoral fraud. The research presented here is the result of polling and the tracking of political opinion in eleven rural and small urban areas with populations between 8,000 and 34,000 people in Fars and Isfahan provinces in the following periods: two five-month intervals from June 2008 to March 2009; and late April, the first week of June, the middle of July, and the middle of September in 2009. * The polling, done by people local to these areas, was conducted in various places of employment and recreation, via telephone, and face-to-face. Despite organizational difficulties, the total amount of people who participated over this period was 11,529. The study tried to reflect the demographic percentages of each town in the sample groups. For example, the largest group polled in most areas was the 20-to-32-year-old age group, which is the dominant age group, according to official records. The methodology for the study was based on theoretical work on polling conducted in non-and semi-democratic polities: http://www.insideiran.org/featured/study-reveals-ahmadinejad-supporters-in-rural-areas-no-longer-back-him/. 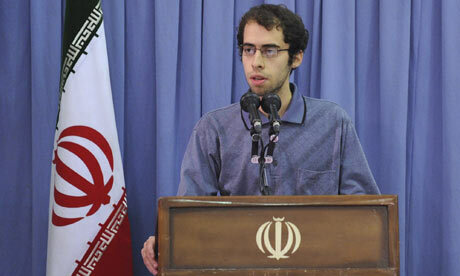 * Ali Behzadian-nejad received a six years jail sentence for the anti-government comments that people put on his blog. You might be interested to know that he is the nephew of Ghorban Behzadian-nejad, one of the organizers of Mr. Mousavi’s election campaign. been used on these detainees: http://www.pbs.org/wgbh/pages/frontline/tehranbureau/2009/11/kahrizak-doctor-dies-first-lady-appears-in-public-in-rome.html. * A new investigation reveals Dr. Pourandarjani was poisoned: http://news.bbc.co.uk/2/hi/middle_east/8388728.stm. * A young Iranian student who won an international math contest two years ago, speaks critically of the Iranian Supreme Leader in a Q&A session with him: http://www.guardian.co.uk/world/2009/nov/06/iran-student-criticises-ayatollah-khamenei. Mahmoud Vahidnia speaking and criticizing the Supreme Leader at the Q&A session. * The Iranian American community is learning to use its voice. Hours after two Fox commentators made derogatory remarks about Hamed Haddadi an Iranian American NBA Player, thousands of demands for apology were made. Fox had to apologize to Haddadi, twelve hours after the two anchors had made their remarks: http://www.niacouncil.org/index.php?option=com_content&task=view&id=1557&Itemid=2. 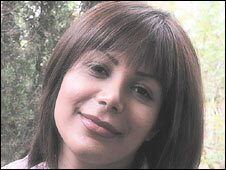 * Neda Agha Soltan was shot to death during a protest that took place days after the disputed election in Iran. The scene of her shooting and tragic death was captured on cell phone and viewed worldwide. 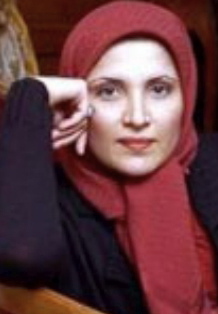 She has since become the symbol of the Iranian youth’s protests to the 2009 election. Queen’s College at Oxford has just announced the establishment of an Iranian Studies Scholarship in honor of Neda: http://news.bbc.co.uk/2/hi/middle_east/8354372.stm. Is There a Threat of an Israeli Attack on Iran? * Amidst uncertainties about the new steps the current government might take to curb further protests to its legitimacy, Iranians continue to show great interest in music and other art forms. * In Iran, many artists are iconic figures for reform – distinct among them the legendary vocalist, Mohamad Reza Shajarian. Shajarian who had spoken candidly about the undemocratic nature of Mr. Ahmadinjad’s government while in Germany was reprimanded upon return to Tehran last week. Nonetheless, due to his immense popularity, no arrest was made. 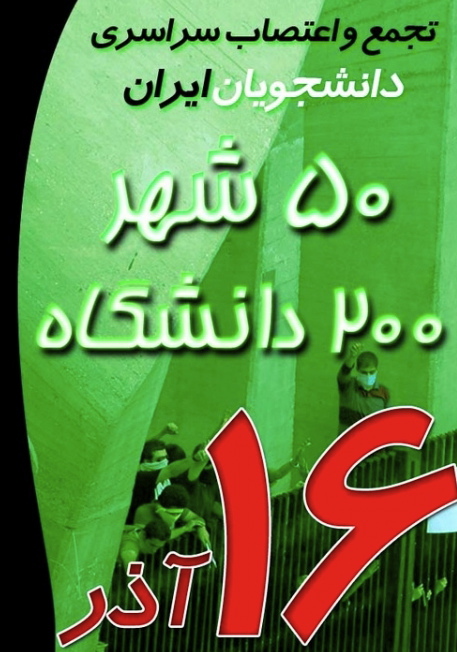 The poster reads: "Students Strike All Over Iran: 50 Cities, 200 Universities". See the link below for many more examples of the posters circulating in Iran currently. * In the meantime, Iranians prepare for another day of protest: “Students Day,” the 16th of the Persian month of Azar (Dec. 7). The posters for this day are already circulating. One of them is on the right and many other examples are here: December 7th Student Protest Posters. Protests continued in Iran on the anniversary of the day the students took over the American embassy in Iran. Today, however, protestors were out to protest the summer election results and show their support for the Green Movement (Photo: November 4th, 2009). Wednesday, November 4 was an important day in Iran. The official commemoration of the day the students took over the American embassy after the 1979 revolution turned into another occasion for widespread protests against the government of Mr. Ahmadinejad. Another photo from the November 4th Green Movement protests. A Book by one of my Stellar Students! * Before the political events in Iran took over the windows, I used to introduce great books about Iran from time to time. I have one for you in this window called the Tribeswomen of Iran: Weaving Memories Among Qashqa’i Nomads. The author? My very own student in Persian (2003-2004) Julia Huang. Julia continued to study Persian at Yale (in addition to Turkish and Arabic). She graduated from Yale in 2008. She was a Fulbright Scholar in Turkey in 2008-2009 and conducted research on NGOs there. She is currently coordinating three NGOs in Mumbai, India. Next year (2010-2011) she will be studying at the London School of Economics and will be writing about her NGO work in Turkey, Central Asia, the Caucasus, and now India. Check the book out at Amazon. * Hengameh Shadidi is an Iranian human rights activist, who has been in prison for the last 124 days, despite her heart condition. She decided to go on a hunger strike to protest her arbitrary detention and after 8 days she lost consciousness. She is currently in the hospital. To the right is a beautiful picture of her. 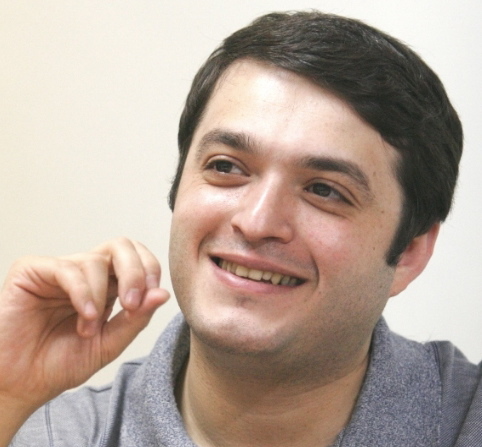 * I’temade Melli‘s editor-in-chief, Mohamed Ghouchani, was released from Evin Prison on October 30th after 131 days in prison. He was left on the street at 2:00AM—no explanations, no accusations. What is the Best Course of Action for the U.S.
* The Iranian Nobel laureate Shirin Ebadi thinks the U.S. must press Iran for Human Rights violations: http://www.mcclatchydc.com/251/story/77184.html. Open Travel says "Iran's most precious jewel is its people" and that Iran has some of the friendliest people in the world. They conclude: "The hospitality of ever-smiling Iranians is sincere and simple - they are always eager to help travelers, offer a cup of tea, pay for your lunch or invite home for dinner." * How is friendliness measured? No idea, but you can see the article for yourself: http://opentravel.com/blogs/5-friendliest-nations-on-planet-earth/. Would you like to receive the “Windows on Iran” series by Dr. Fatemeh Keshavarz in your email box?